Why do I have to submit a new disability plate/placard application every four years if my condition is permanent? You must periodically update your contact and mailing information with the Bureau of Motor Vehicles. This will be done when your current credential expires. Use our PS-18 form, Disability Plates/Placard application and fill out the top portion of the form only. There is no need to return to the medical provider's office for this update. If I have only disability plates, do I still have to submit a new application every four years? Yes, the law requires you update your contact information when your driver's license or State identification card expires. Beginning October of 2011, we will work to expire newly issued credentials on the same year and day as your driver's license. How do I display my disability placard? The placard must be displayed by hanging it from the rearview mirror when the vehicle is parked in a space for persons with disabilities. Is it acceptable to operate a vehicle with a disability placard hanging from my rear-view mirror? No, the definition of a placard in law is "removable windshield placard". The hanging placard may obstruct the operator's view making operation of the motor vehicle unsafe. Do I have to pay meter fees when displaying a disability plate or disability placard? A vehicle displaying a permanent placard, a temporary placard or a disability registration plate may park in a parking area with a meter without a charge, and may park a length of time that does not exceed twice the limit otherwise allowed. What types of disability plates are issued in Maine? A person with a permanent disability may choose to display a disability plate on their vehicle. BMV offers (pictured left to right) a standard issue chickadee disability plate, a conservation disability plate, a disability special veteran plate, a disability motor home plate, a disabled veteran parking plate, and/or a disability motorcycle plate. Is there a fee to obtain disability plates or placards? What do I do if I lose my placard? Contact the Bureau of Motor Vehicles or visit your nearest Motor Vehicle Branch office for a replacement. Your application must be on file and current with BMV. The expiration date of the new replacement placard will be the same as the old placard. What are the standards for qualifying for a disability plate or placard? 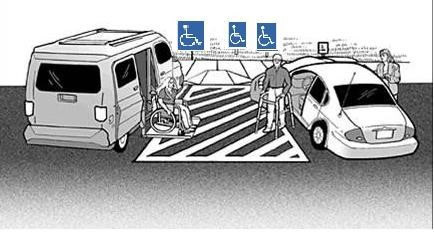 Are there different types of disability parking placards? Yes. Pictured left to right: Blue placard: permanent placard issued to individuals with a permanent condition; Red placard: issued to individuals for a period of up to 6 months for a temporary condition; Green placard: issued to agencies and organizations transporting patients and clients. When is it acceptable to park in a disability parking spot with an access aisle? A person may park in a disability parking space with an access aisle when a disabled person needs the access aisle to enter or exit the vehicle; or when no other disability parking space is available. The vehicle must display a disability parking plate or placard, and must be transporting a disabled person. In no case, may a vehicle be parked so as to block an access aisle. Misuse of an access aisle is considered a traffic infraction and subject to a fine of not less than $200.00.